It has been factory unlocked and the phone now works with all UK networks. The Samsung has been erased and reset to factory settings with the latest version of Samsung software for it installed. The condition of the Samsung itself is in excellent condition With little and minor signs of wear. Samsung Galaxy Note8 SM-N950 - 64GB - Maple Gold. Phone is in rather good condition. Some scratches on the screen. Normal wear n tear. Phone comes with box. 3 cases and charger. 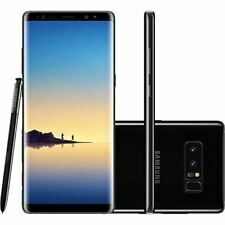 New listingSamsung Galaxy Note 8 Black - 64GB - SIM FREE (UNLOCKED) UK MODEL. Here we have a Samsung Galaxy Note 8 Black - 64GB - SIM FREE (UNLOCKED). This phone works with any sim card, as long as it's a NANO size. This phone has been logged out of Google and Samsung accounts and fully restarted from Scratch So you won't get locked out. Has 2 tiny very minor mark's on the back only visible under bright light but not in the pictures here. Samsung Galaxy Note 8 64GB black. Samsung Galaxy Note8 SM-N95000 - 64GB - Orchid Gray (Unlocked) Grey Import ..
Samsung Galaxy Note8 SM-N95000 - 64GB - Orchid Grey (Unlocked) Hong Kong Grey Import. 4.5 out of 5 stars - Samsung Galaxy Note8 SM-N95000 - 64GB - Orchid Gray (Unlocked) Grey Import ..
8 product ratings8 product ratings - Samsung Galaxy Note8 SM-N95000 - 64GB - Orchid Gray (Unlocked) Grey Import ..
Front and back are mint condition. Samsung Galaxy Note8 SM-N950 64GB - Midnight Black. Unlocked - Good condition - No Box. Unlocked to all networks. Samsung Galaxy Note 8 Duo sim card SM-N950F/DS - 64GB - Orchid Gray (Unlocked) Smartphone with Midnight Black screen.Condition is Used like new condition. Dispatched with FREE ROYAL MAIL NEXT DAY DELIVERY. ★★ 100% Feedback Buy With Confidence ★★★I take pride in being an ebay member with 100% positive feedback. I brought this item new and its an international dual simcard model. A Samsung Galaxy Note 8 Orchid Grey with a Midnight Black screen as the screen was replaced as I had chipped it. See the actual pictures, there is a slight noticeable colour change at the bottom back this does not affect in anyway the phone it self. The phone comes with all the original items; unused original headphones, unused pen tips etc. Note the charging plug is an American 2 pin.A Bid with confidence.! Or collection from WS12 Cannock area. I have for sale a Samsung Galaxy Note 8 Midnight Black 64gb (O2) SM-N950F Condition is Used I’ve had this item from new and am only selling due to upgrading I got this on o2 so not sure if it’s unlocked as I’ve not tried another sim Item in good condition with few scuff marks around edges and a few very faint marks on screen (see pics) Comes with case which is in excellent condition Item will be sent Royal Mail special delivery UK bidders only!! Thanks for looking and happy bidding. Samsung note 8 EE NETWORK very good conditionp en included. Samsung Galaxy Note8 SM-N950 - 64GB - Midnight Black (Unlocked) Smartphone. Condition is Used. Dispatched with Royal Mail 1st Class. Ultra-slim, super-strong Tempered Glass screen protector. 1 x 4d Curved Screen Protector. Scratch-resistant explosion proof anti water,oil,fingerprint and easy to clean. 100% Full Screen Cover 4D Curve Edge. The phone is just under 9 months old with fantastic battery life and has always been in a case with screen protector. Samsung Galaxy Note 8 - Mint Condition. There is no receipt with this item as it being sold on behalf of my daughter (it was a gift from her ex-boyfriend). This phone has been network unlocked so will work with any network. Free 12 Month Warranty Included! Samsung Galaxy Note8 SM-N950 - 64GB - Maple Gold (Unlocked) Smartphone. Condition is Used. Dispatched with Royal Mail 1st Class. This is a working handset with some slight damage to the screen in the top left (please see photos for the cracks) and some pixelation damage on the far right of the screen. Other than these flaws it is in good working order. Please note that the lines shown on the 'google' homepage were not on the handset itself, just on the camera. The original charging cable has been lost but a replacement cable is included with the original plug. Supplied in genuine Samsung box with Samsung USB Type C cable, wall plug, headphones and adaptors. All our handsets are supplied fully tested and found to be in correct working order. The handset has been factory reset and all information wiped. Samsung Galaxy Note8 SM-N950F - 64GB - Midnight Black (Unlocked) Smartphone. Condition is Used. Bought unlocked SIM free. Bought with a Ringke case. Comes with no accessories as I have no clue where they are. Maybe 18 months old. Not barred or blocked. Owned since new. Happy to post to UK only. Current eBay suggestion only includes postage with 20 pounds insurance. You can buy more if you want. Screen and back are in perfect condition. Some sand or dirt may have got in the side of the case as there seems to be a couple of tiny marks as pictured. Any questions just ask. Hi, here for sale is my Samsung Galaxy Note8 SM-N950 - 64GB - Midnight Black (Unlocked) Smartphone. Condition is Used. Overall in great condition, however there is a small chip in the front screen and a few very very slim cracks to the bottom right of the screen. With a larger design that fits ergonomically in your hand for precise control, a Samsung Galaxy Note8 bridges the gap between tablets and smartphones. Filled with advanced software and designed with sleek curves, this Samsung smartphone comes in either midnight black or maple gold. The S Pen is designed specifically for use with the Note8, giving it endless possibilities. The fine 0.7mm tip offers serious precision and 4096 different levels of pressure, offering you a customisable drawing experience. Use the pen to draw on photos, perfect for adding your own emojis or handwritten messages. The Smart select feature cuts out a section from a video to create a GIF. You can also make notes with the S Pen when your phone is locked, perfect for quickly jotting stuff down. The dual cameras work together to take amazing shots. Optical image stabilisation reduces camera shake to keep your shots clear whilst the Live focus function lets you get the perfect amount of focus before taking your picture. You can even adjust the background blur after the shot is taken, too. With both cameras turned on, you'll get two perfect shots. One is the shot you lined up, whilst the second gives you a behind-the-scenes look. Low light situations are no longer a no-go for photos, as you can take the perfect pictures even in the dark. The Infinity display makes for a truly immersive visual experience. Measuring at 6.3 inches, the edge-to-edge screen sits on more of the phone than ever. The larger screen of this Android smartphone works with Multi Window mode to show you two apps at once, letting you multitask with ease. Samsung Knox keeps your phone secure as you can unlock your device with an iris scan, facial recognition or fingerprint scan, or pattern, password or pin entry. A customisable amount of storage lets you turn your 64GB Samsung Galaxy Note8 into a device capable of holding 256GB of data.